Sotelo is at a makeshift shelter that is called – ironically – “Camp Freedom.” But no one there feels free or secure – or comfortable. “The elections are over and here we are. There were Blackhawk helicopters flying over all day and night. They have heavy equipment moving past the tents all night,” he said, an apparent reference to the difficulty he and his family – and other camp dwellers – have in trying to relax and get some rest. We suppose the paper was lucky to get any interview at all; no media is allowed inside “Camp Freedom,” which also serves as a base of operations for power company workers who are not from the area. Until recently, the camp was also a shelter where first responders, construction and utility workers could take a break, though the compound now contains a full-time shelter that is being maintained by the state Department of Human Services. “All the while, a black car with tinted windows crests the hill and cruises by, as if to check on the proceedings,” the paper reported. Sotelo said “residents” of the tent city have recently become so frustrated with their situation, they are doing all they can to let the outside world know – but are being thwarted at every turn by the powers that be. For instance, he says, officials have tried to stop camp dwellers from taking pictures, turned off the WiFi and have told residents they can’t charge their cell phones due to a lack of power. “Every time we plugged in an iPhone or something, the cops would come and unplug them. Yet when they moved us in they laid out cable on the table and the electricians told us they were setting up charging stations. But suddenly there wasn’t enough power,” he continued. Sotelo said there was a foot of water in his home when he was forced to leave. Now, he wonders why he isn’t allowed to return. “Everybody is angry over here. It’s like being in prison,” he said. MIDDLETOWN, N.J. — In a sign of how long the rebuilding effort in the Northeast will take, the Federal Emergency Management Agency is shipping in temporary, manufactured homes for displaced residents. About 317,000 people across the region have registered for FEMA assistance, and an estimated $314 million has been allocated for about 61,000 recipients, mostly for rental assistance. The cost and number of registrants is expected to grow. 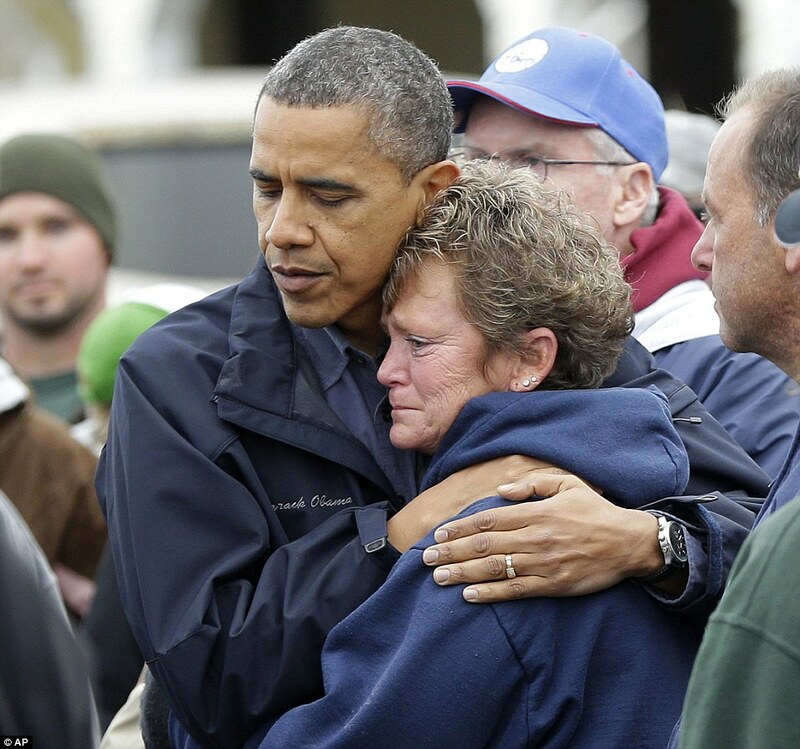 At least 110 people were killed and thousands displaced since Superstorm Sandy caused an estimated $50 billion in damage and economic loss from the Carolinas inland to the Ohio Valley and all the way north to Maine. The storm, combined with a nor’easter that knocked out more power and buried recovering cities in snow Wednesday, will be the second-costliest natural disaster in U.S. history after Hurricane Katrina, according to National Weather Service statistics. The recovery is going slow, particularly in New York and New Jersey. By Thursday evening, more than 735,000 people remained without power in those two states alone. In Middletown, where residents evacuated ahead of Wednesday’s nor’easter, Nilsa Colon was back volunteering at a disaster relief center Thursday. Colon, 42, and her husband piled clothing and food into a van at the Middletown Assemblies of God Church and drove around nearby Keansburg, a hard-hit waterfront town where debris was piled in front of homes and alongside the waterfront amusement park where storm-damaged roller coasters, bumper cars and other rides sat abandoned. Storm victims are “flooded out and they have no cars. That’s why we’re sending vans in there,” she said. Colon has been trying to find housing for church members who lost everything. A few people slept stretched across chairs in the sanctuary after the storm. The nearest FEMA assistance center is in Union Beach, about five miles away, and many storm victims lost their cars to flooding. Colon says she knows FEMA has offered some of the displaced people housing, but miles from their neighborhoods. About 40 manufactured homes were headed to the region, although no state has requested the homes yet, FEMA said. Where the mobile homes will end up is anyone’s guess. The states and FEMA work together to determine what kind of homes are needed and where they go. Residents can live in the mobile homes for up to 18 months, according to FEMA guidelines. 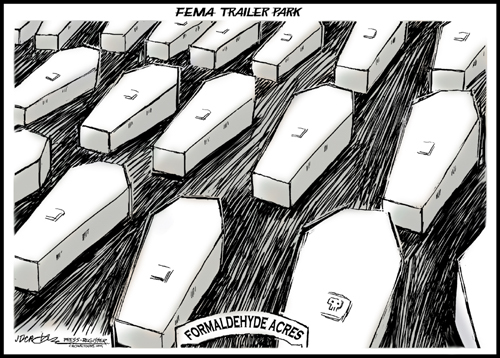 FEMA Administrator Craig Fugate said during a Thursday morning conference call with reporters that these are not the same temporary shelters used during Katrina, when some were found to contain toxic levels of formaldehyde. The latest ones adhere to Department of Housing and Urban Development standards, Fugate said. Since Sandy made landfall Oct. 29, thousands of storm victims found temporary refuge in American Red Cross and Salvation Army shelters. It’s unclear, however, how many will be able to return to their homes anytime soon. Utility companies have to go door to door to evaluate the damage to equipment and buildings to see whether they can reconnect power and gas. If they can’t, homeowners may need a more long-term solution. FEMA said 1,600 people are already using the agency’s help to live in motels or hotels. With 107,000 people qualified for similar accommodations, many places could soon be jam-packed if displaced Sandy victims don’t stay with friends or family. On New York’s battered Staten Island, many victims have left to stay in shelters or with loved ones. In Midland Beach, Norma McCarthy, a mother of two teenage boys, said she remained in her flooded home because her relatives’ homes in New Jersey and Queens also were without power. “We don’t really have anywhere else to go,” McCarthy said. She applied for FEMA assistance the day after Sandy hit, but said she hadn’t heard back. These “terminators” would easily be the most effective weapon against civil unrest or radical revolutionaries that did not subscribe to the globalist agenda. In the wake of Tropical Storm Sandy, the Pentagon has requested that a team of “rescue robots” be engineered in time for the next “natural disaster”. 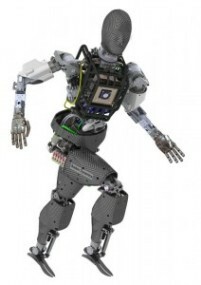 The DARPA Robotics Challenge is putting out the call for a synthetic force that can be designed for autonomous thought; yet mitigate the risk to human life when preforming a rescue mission. 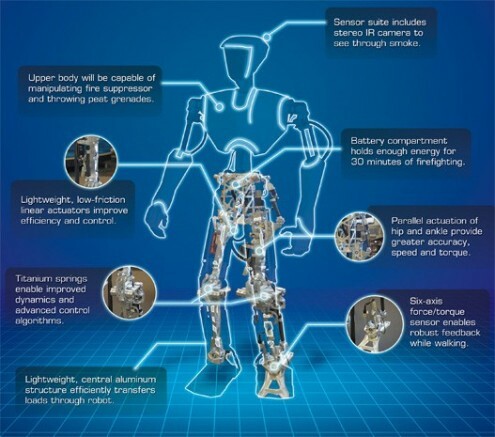 DARPA has awarded Boston Dynamics, Inc. a $10.9 million contract to manufacture humanoid robots that are bi-pedal, built like humans and have a sensor head with on-board computing capabilities. 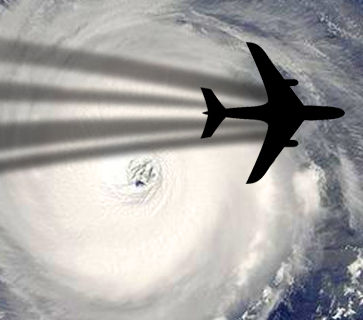 Completion of the project is expected for August of 2014.